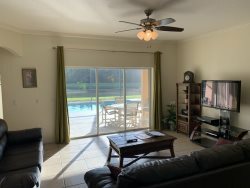 This home was truly EXCELLENT Reviewed by: frowoman from LaGrange, Georgia Reviewed on: 07/06/2015 for their stay in 07/2015 When arriving to this vacation rental my family was astonished. This home was beautiful inside. We loved every minute in this home and would recommend this home to anyone who is looking for a vacation rental. There was so much space in this house no one felt crowded at any point. Reviewed by: Dawn19700 from England, United Kingdom Reviewed on: 01/20/2016 for their stay in 12/2015 Fantastic Five Bed Had a fantastic holiday with my family... crammed so much in with only a weeks stay at this lovely villa which had everything you could need. Had an issue with one of the door locks but Stewart very quickly had this fixed. Would definitely recommend not only the villa but Stewart too. This will be our fifth visit to Florida and each time we have used PRV- Vacations. We have not hesitated in returning to PRV as on each occasion Annette and Stewart have provided us with great family places to stay. The homes are immaculately clean, well-appointed and near all the attractions. Their Knowledge and recommendations of the local area are also great. If we have had any issues we have been confident in knowing that they will be resolved quickly. Pricewise PRV have always been very competitive. We would recommend them every time for the perfect holiday. L.H. England, U.K.